I don’t involve too much of iPad apps development recently. From my understanding on the Auto Layout in XCode 6, The Width vs Height selection is just a guideline. The guidelines for iPad, it would be Any Width | Regular Height, Regular Width | Any Height and Regular Width | Regular Height. 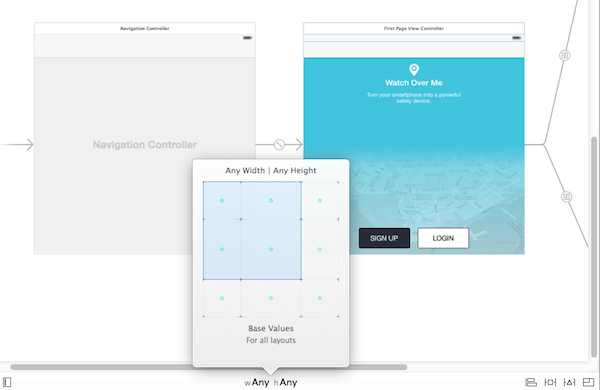 So, you may start to develop the constraints in Any Width | Any Height, make sure that the 3 guidelines above look good and then try to run on the iPad simulator. Thanks for the compliment. I will be posting another post related to more advance techniques in Autolayout this month when I have some free time. Great tutorial, got layout sorted now apart from how i use this new layout style with scrolling content? if its single screen it all works fine and adapts perfectly to dif devices. can you do a tutorial of using this with scroll as well please!? I am glad that you find it useful. What you do mean by “scroll”? Do you mean there will be more objects inside the same view controller and I will have to use a UIScrollView and put all the objects inside it? Yes, I will make a new tutorial regarding that soon. Hopefully I will find some time to make the tutorial within the next 1 week. Did you ever write a tutorial showing how to do this in a UIScrollView? Seems I can’t get the content view to size correctly when I move from a iPhone5 to iPhone 6. Yes, I am writing one. Already written half way, still finding time to complete the entire tutorial. Now, I am struggling to understand how to set the constraint with 2 or more objects. Hi, I’m new to GitHub , where can I find the basics in GitHub, I see the .swift files is that one I should look to learn the basics ? You just go to https://github.com/voyage11/AutoLayoutBasics and then click on the “Download Zip” button on the right hand side. After downloading, you will have to unzip and you will have the entire XCode project. You will have to have the entire project in order to run it. 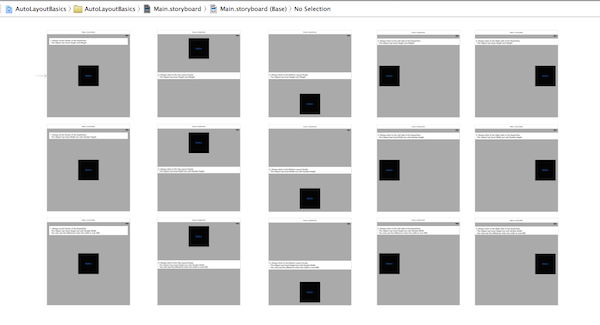 I have done all the Auto Layout Constraints on the Storyboard itself. So, the .Swift files are just the empty files. Should we only design layout based on 600×600 (even in retina iPhone5) ? Image looks like not delicate….. Yes, you should. 600 x 600 is a just a design template. If you add the constraints correctly. The layout will auto adjust based on the screen size of the phone. I will explain better in a new post related to the Advance Auto Layout techniques that I have written half way. I will post a new open source examples on Git Hub as well. Still trying to find time to complete that post. I am not seeing the option to view the storyboard in Any Width | Any Height. I am running Xcode 6.1. Is there anything special you have to do to get this option to show itself? I just have a blank down there, and clicking on it does nothing. I’ve been using auto-constraints all along (I started with late iOS 6). This is a great tutorial. Thanks. Recently I’ve run into problems because I was doing all my constraints in 3.5″ mode. Xcode 6 really doesn’t do well with this (though it worked fairly well in Xcode 5). The Any Width | Any Height thing sounds like it might solve my issues if I could figure out how to invoke it. Thanks. If your project is an old project created from the old version of XCode (Not XCode 6), there is a chance that you will see the storyboard without the Any Width | Any Height with the dimension 600 x 600. 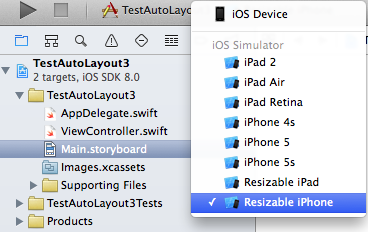 You might need to recreate a new project and move the UI objects one by one to the new storyboard on XCode 6. Don’t recreate everything; by the description he gave us, the problem is he doesn’t have size classes enabled. Size classes and auto layout are two different things, and you can have auto layout without having size classes (but not the opposite). All he has to do is open his storyboard, then open the right Xcode bar on the first item ( CMD + option + 1) and check “Use size classes”. 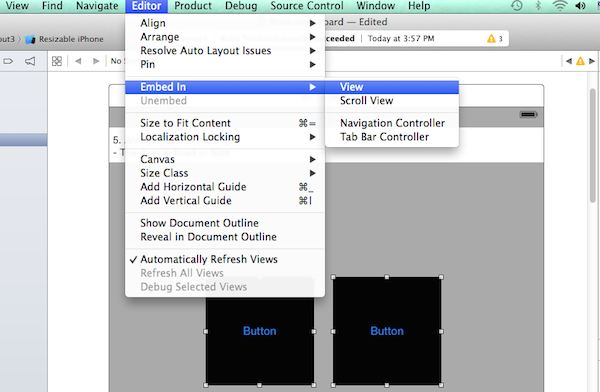 This will make Xcode convert all of your storyboard automatically for you, and you won’t have to do anything at all! “- The Object has fixed Height and fixed Weight”, maybe its a typo maybe not…did you mean to say fixed Width? Thanks for pointing out. I just corrected the typo. I am struggling with auto layout for a while, I hope you may be able to help me with it. Navigation bar, 2 scroll view, 1 with image view and other with AQGridView. The image view allows user to see photos like photo app, and the grid allows selection. The moment user starts zooming in pic, I see lot of messages related to constraint in log. Is there a way to do it better? Setting Constraints with ScrollView is not easy. I have been using the Autolayout and constraints for many months. Sometimes I will also stuck and reconnect the constraints in a view controller that has scroll view. If you see the constraints conflicts error on the log, it means there must be something wrong. The best advice that I can give you is clearing all the constraints inside the View Controller and redo all the constraint. Always make sure that there isn’t any error/warning when you are connecting the constraints. I am still finding time to complete it. I will upload another project with more autolayout examples on Github. I have a few examples related to using scrollview with Auto Layout. It is under the other article. But I haven’t complete that article yet and I haven’t upload the solution on Github yet. I need some more time to do it. Thank you very much, I found it’s really useful for me, but when I created a scroll view in my project, the strange thing happens : in the iPhone 6 simulator,the scroll view’s size is 320*160,it occupy the full screen width just as it was on iPhone 5 and iPhone 4s,but when I add some subviews in it , the subview can not occupy the full screen in iPhone 6 simulator ,please help me . Nice article, mate. I stopped developing for iOS when iOS 5 was still the new thing, so when I came back I found myself saying “dafuq is this” as my controls were all messed up haha. I can say that your examples are a bright light in the dark. Thanks. Very nice tutorial, helps a lot. Thanks. If i designed in Any Width | Any Height and applied constraints for all UI, Is that enough for me to run the app in all iPhone devices??? 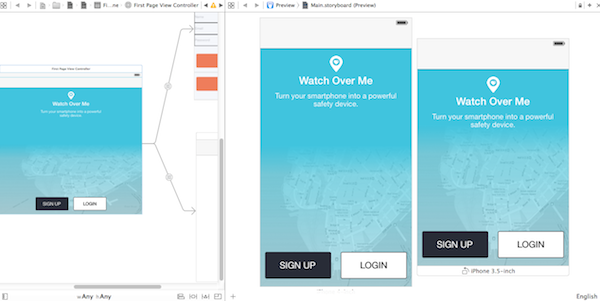 friend my problem is i am using storyboard drag the view controller uicollection view cell ,cell add the uiview and uiview loading the custom image view . my problem is how to add the constraint in collection view cell and custom image view? Is there any way to scale up font size also? As we don’t have any size class (width and height combination) which separates iPhone 6 or 6 plus (Portrait) from other, I am not able to provide large font size for such high resolution iPhones.